'Mrs Markham' was the pen-name of Mrs Elizabeth Penrose (1780 - 1837), who was the daughter of Edmund Cartwright, one time vicar of East Markham in Nottinghamshire, and inventor of the power loom (1786). As a child Elizabeth spent much of her early life with her Cartwright aunts (The Misses Cartwright) at Midfield Hall at East Markham, and took the village name as her nom de plume whilst visiting the village during the writing of her History of England in the early 1860s. In 1814 Elizabeth married the Rev. John Penrose, rector of Fledborough in Notts. In character, she was described (in a letter quoted in Baldwin's "Penrose's of Fledborough Parsnage") as "always good tempered, more gay, more lighthearted, more open, more a woman of the world than her sister, and at the same time seems to have all the gentler and milder virtues.... She is somewhat of a chatterbox, but then she knows how to talk sense..."
"She went with some of her family to pay a call at the house of a friend and the host startled her by exclaiming that 'There is a new History of England by a Scotch lady, mentioned very highly in the Literary Journal'. 'What is the title?' asked her husband. 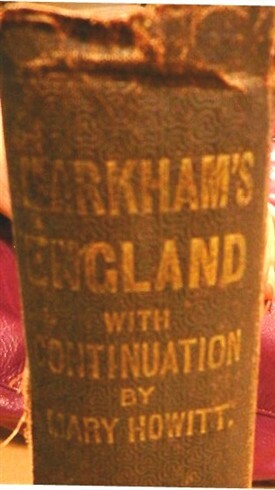 'I will go and see', replied the host, and upon returning he said, 'It is by a Mrs. Markham: do you know anything of it?' 'I have seen it; it is a very pretty book', evasively responded Mr. Penrose. 'Luckily no-one looked at me', wrote Mrs Penrose, 'for I am sure I looked all manner of things. However, if they did, I comforted myself with thinking they would only suppose I had scalded myself with hot tea'......"
She died in 1837 (24th January) and is buried at Lincoln Cathedral. There is a commemorative window to her in the parish church of St.John the Baptist at East Markham. 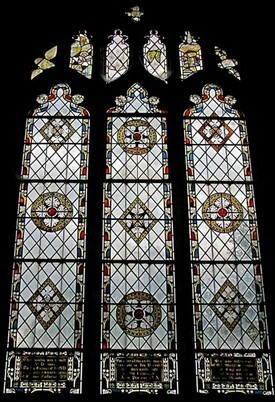 The window is the middle window in the south aisle. The inscription at the bottom reads "This window was rebuilt Ao. Dni. 1885 To the honour of GOD and in memory of Eliza. Daughter of Edmund Cartwright DD For many of her earlier years resident in this Parish, and afterwards wife of the Reverend John Penrose MA. 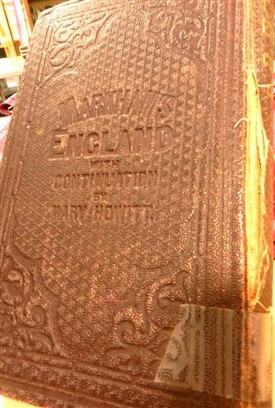 She was authoress of Mrs Markham's History of England etc and was buried in Lincoln Minster in 1837"
Published by Allman in 1865, the book was innovative in that each chapter contained the script of a 'conversation' between Mrs Markham and various children, bringing out the main historical points covered in the preceding chapter. This page was added by Website Administrator on 14/12/2017.